Dolf is a darts game that combines Golf & Darts and was invented September 1st, 1999 in Winnipeg, Manitoba, Canada by two brothers, Mike Meyer and Keith Meyer. – Use each area of the dartboard. – Reward players with greater dart skills, yet be balanced enough that the average dart player can still enjoy the game. – There should not be a limit on score; both the worst score and the best score should be infinite. 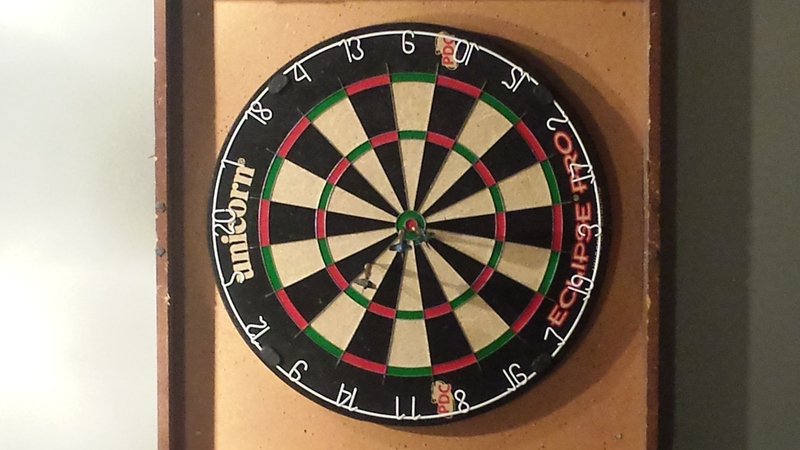 – In a regular 3 dart hole, the player should always be able to par the hole on their last shot. – Until the game is over, there should always be a chance for any player to win the game. – Be a dart game first and a golf game second. This image shows the first ever Dolf game, that was ultimately won by Keith 16 to 25. The game gained popularity in Winnipeg over the first few years as the game spread by word of mouth. Eventually, as individuals from Winnipeg travelled or moved to other countries, the game become known to many across Canada and around the world. 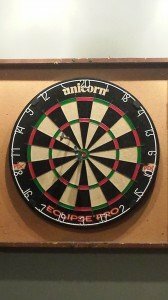 Dolf uses the same dart board that you are familiar with and the same darts. You don’t use a golf club or play on golf courses and there is no mini golf version but it is very fun! Hopefully Phil Taylor will play it one day! The current recognized best Dolf score is -35 scored by Keith Meyer on September 17, 2014. Adam Saurette won the first recorded Dolf tiebreak on Dec 22nd, 2014 by hitting the Hooves and the 25 consecutively.